Sometimes movies can be an uplifting experience. Sometimes they can be difficult to watch. Sometimes they can be technical works of art. Danny Boyle’s new film 127 Hours encompasses all of these traits. It is based on the true story of a man’s rock climbing accident which resulted in him being trapped and deciding to cut off his own arm in order to escape. This story was published in 2004 in the autobiography “Between a Rock and a Hard Place” by Aron Ralston. Being familiar with the story I knew it was going to be an emotional and harrowing experience. There is a wonderful message of loving your fellow man and not secluding yourself from society for selfish reasons. But clearly, our protagonist must go through some hard repercussions before coming to this realization and having his turning point; much like that of Scrooge’s epiphany in A Christmas Carol. But in the famed Dickens story, Scrooge doesn’t cut his arm off with a dull blade. I knew this was going to be a difficult part of the movie to watch. Watching someone cut off their own arm is no cup of tea. I had in fact advised my girlfriend not to come along to see the movie knowing how graphic it could possibly get and knowing her limits to what she can stomach. Until now, I never thought I myself would be overwhelmed by such violence. Having watched numerous violent movies, I’ve most likely been desensitized to violence. But then again, this was real violence, not like the cartoonish Tarantino or Schwarzenegger movies. In 127 Hours, the ‘arm-cutting’ scene is played as realistically as possible. I thought I would have been able to handle it, but I had to close my eyes; I even felt queasy and broke out in a sudden sweat. I would’ve ran to the washroom if there wasn’t only 10 minutes left in the movie. I stuck it out, but could not keep watching this self-mutilation (particularly when he hit his nerve endings - just thinking about it makes me cringe). That being said, this is still a high quality movie that accomplishes everything it sets out to do and doesn’t waste a single scene. Obviously James Franco does a fantastic job while having the whole film rest on his shoulders. Yet the genius of this film lies in Danny’s Boyle’s editing. As I find with most of his films like Trainspotting, 28 Days Later and Slumdog Millionaire, the stories are usually nothing interesting but his editing and direction are what make them a level above most. 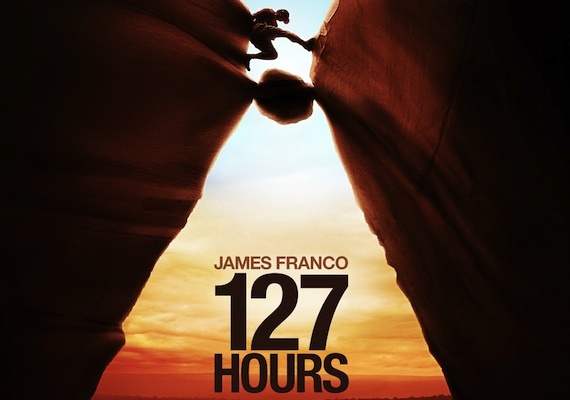 The editing in 127 Hours is fantastic. Easily the best opening for a film all year (except for maybe Shutter Island which is done by another great editor: Scorsese). Since the film is restricted to mostly one location, Boyle succeeds in trying to find as many different ways to use the camera in the claustrophobic cavern. Using flashbacks and fantasy sequences would seem cheesy or could be considered as cheating, but the transitions in and out of reality are seamless and feel natural. He puts the audience in the protagonist’s headspace by having us longing for the flashbacks since they are enriched in colour in comparison to the pale, dread-filled cave in which he is trapped. Summary: This is a magnificently edited film with an emotional journey that will make you want to call your parents to say how much you miss them. However, if you have a weak stomach this is not for you. Or just close your eyes for the last 10 minutes.